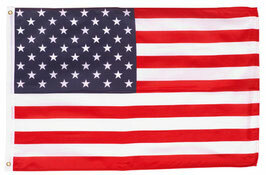 Top quality United States outdoor banner flags made from durable Knitted-Nylon or Endura-Polyester. They are finished with a strong canvas heading and two brass grommets. The Nylon flags have embroidered stars and sewn stripes. These flags look great outdoors, especially in front of homes. Only includes the flag, not the flagpole. 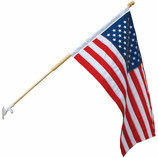 All of our U.S. Flags are proudly "Made in America". Our U.S. 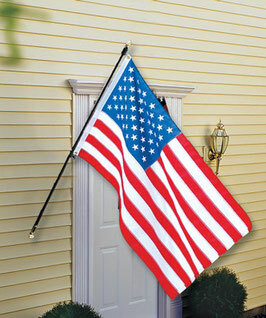 Residential Outdoor Standard Flag Sets are available in Nylon and Endura-Poly-Cotton. Top quality United States flags made from durable heavyweight Knitted-Nylon. They are finished with a strong canvas heading and two brass grommets. These flags look great both outdoors and indoors. Top quality United States flags made from durable and attractive 2-Ply Polyester (Poly-Max). They are finished with a strong canvas heading and two brass grommets. These flags look great both outdoors and indoors. 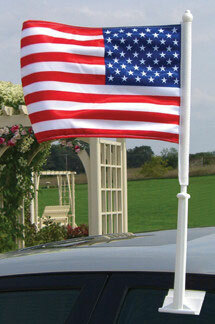 Top quality United States flags made from durable and lightweight Endura-Polyester. The most popular choice for home sets and promotional use. Finished with white header and brass grommets. Top quality United States (Mega-Tuff Outdoors) flags made from a synthetic fiber specially woven to allow the wind to flow with greater ease. They are finished with a strong double-stitched canvas heading and two brass grommets. These flags look great both outdoors and indoors. Top quality USA 4"x6" Endura-Gloss mounted flags. 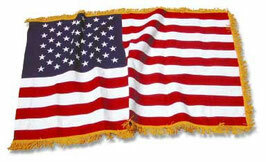 All flags are carefully hem-stitched on all four sides for more durability and complete with with gold spear tip. Flag base sold separately. 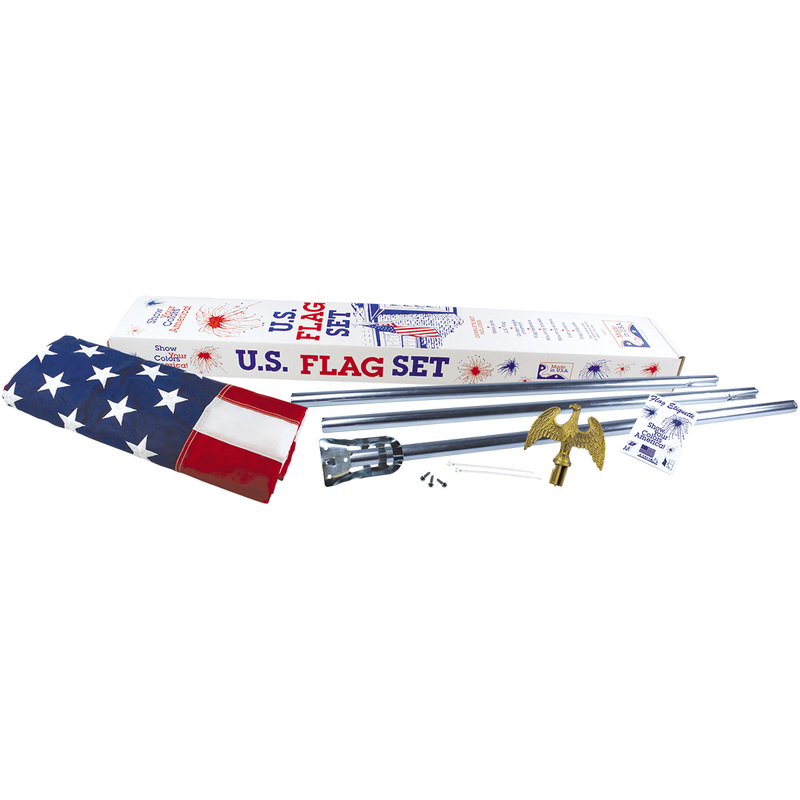 REGAL US flag Sets come complete with a 3x5 Nylon US flag, a solid brass acorn ornament, a flag unfurler, a solid brass mounting bracket, and your choice of a 6ft. white or black fiberglass pole. 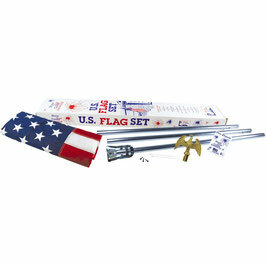 Set comes complete with a 12"x13" U.S. polyester flag and with a one-piece bracket. Made of high-tech plastic and easy to mount on your car's window. These U.S. Indoor / Ceremonial Nylon Flags are complete with embroidered stars, sewn stripes, pole hem, leather tabs, and gold fringe. The indoor flagpole and other accessories are not included.